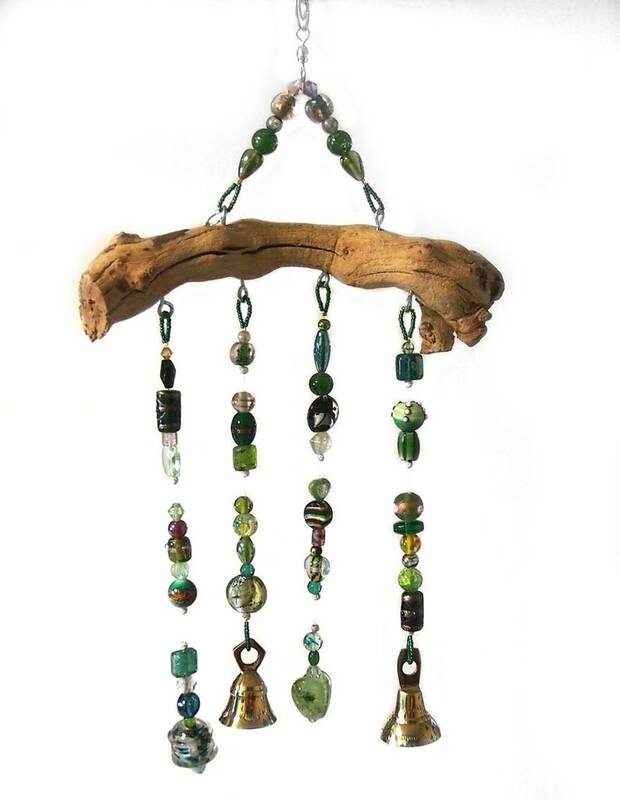 This Green Glass Bead Wind chime features 2 brass bells and 4 strands of beautiful handmade and designer glass beads so that your Sun Catcher Mobile will catch the sun in a sparkling cascade of color and every breeze with the beautiful tinkling tone of tiny brass bells to enhance your garden home. 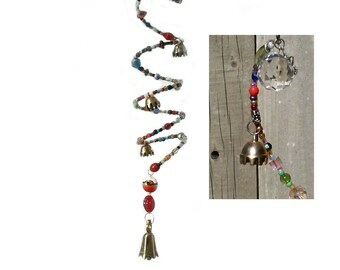 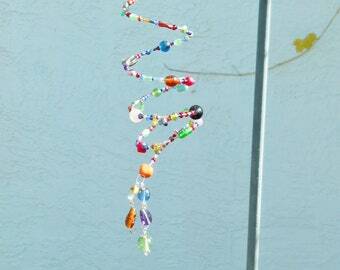 THE PHOTO SHOWN IS INDICATIVE OF THE SUNCATCHER/WINDCHIME YOU WILL RECEIVE. 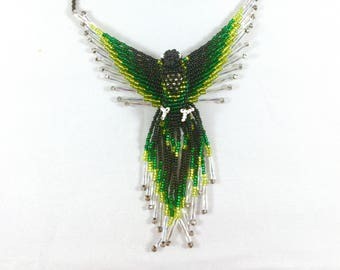 EACH ONE IS HANDMADE SO EACH ONE IS A LITTLE DIFFERENT. 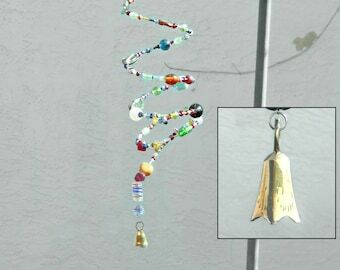 YOUR SUNCATCHER WILL BE CREATED WITH THREE STRANDS OF MOSTLY GREEN GLASS BEADS (THOUGH THE SHAPE AND DESIGN OF THE BEADS MAY VARY) AND WILL HAVE TWO SMALL BRASS BELLS AND TWO CZECH CRYSTALS. 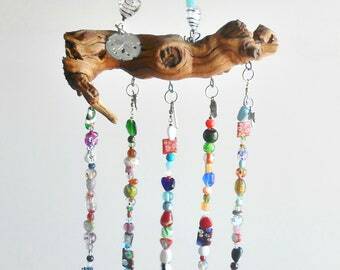 THE DRIFTWOOD/GRAPEWOOD PIECE WILL BE APPROXIMATELY THE SAME SIZE BUT MAY VARY SLIGHTLY IN APPEARANCE FROM THE ONE PICTURED AS THEY ARE ALL UNIQUE. 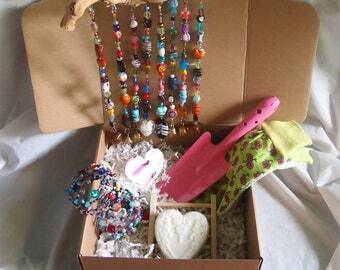 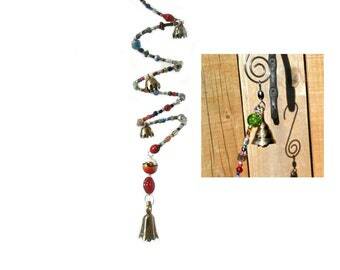 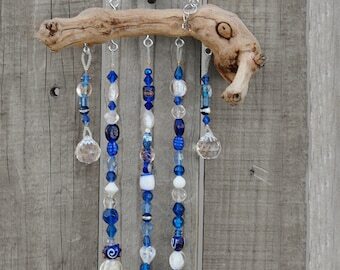 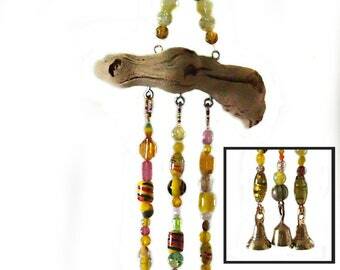 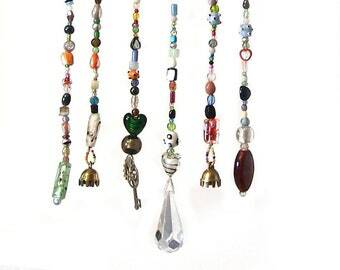 Each beaded driftwood/grape wood mobile includes a stylish curled steel hanger. 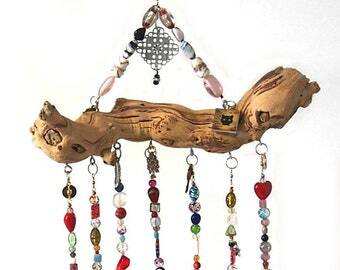 Length of wood: approximately 7.5-8 inches. 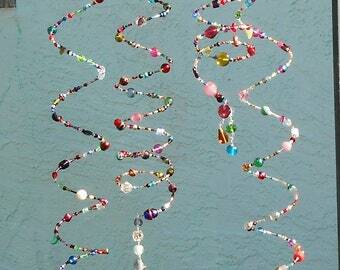 Length of mobile including hanger: approximately 17 inches.